It's mango season again. It's a good time to take advantage of the fruit's abundance. We have been serving desserts made with mangoes since its' season began. This dessert in particular is well received by our guests. 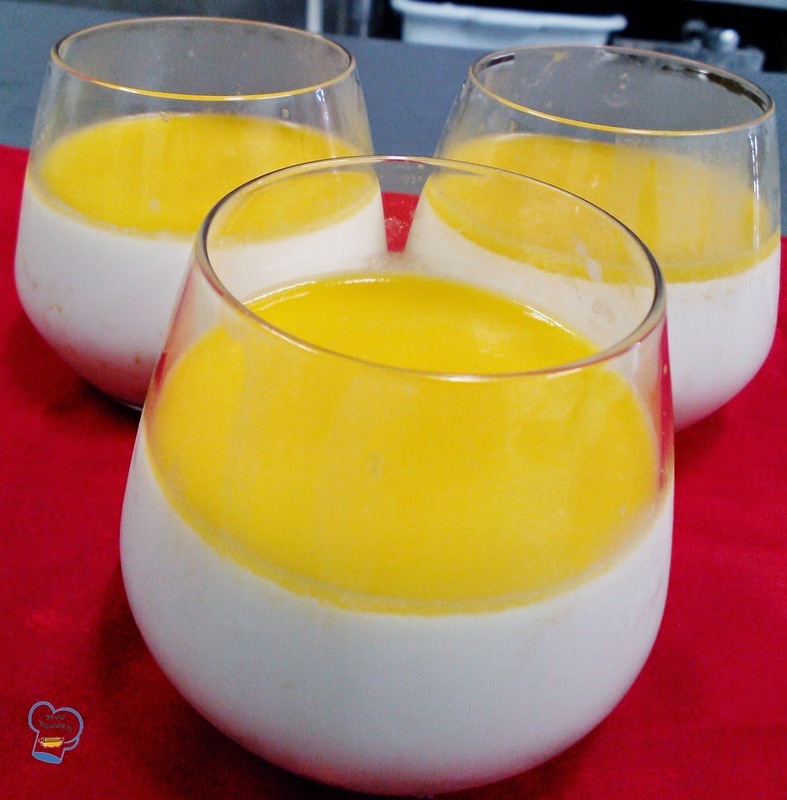 Mango panna cotta is served only at brunch. Since my day off is Saturday, I don't get the chance to make it. After attending brunch, one family was smitten with this dessert. 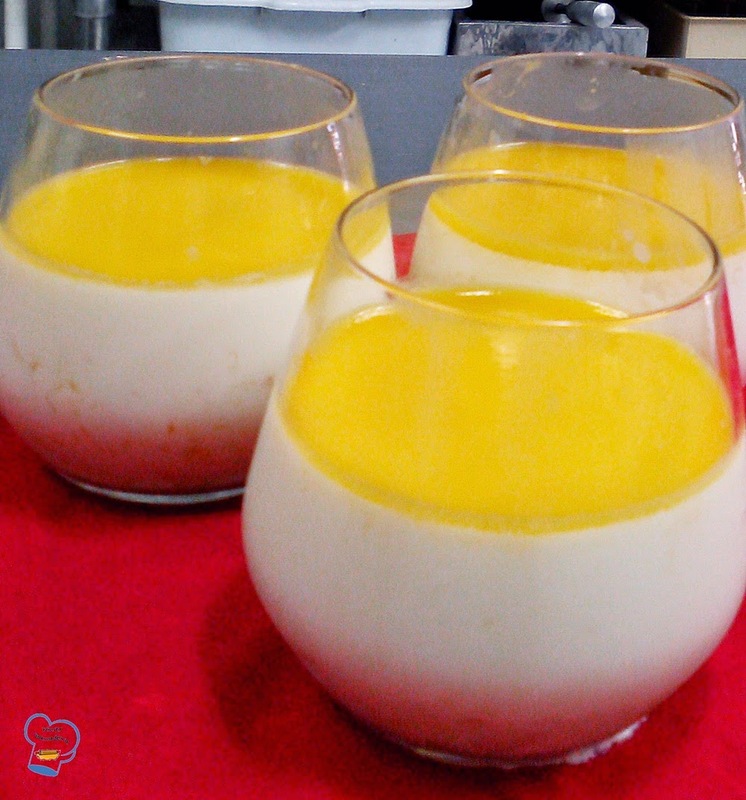 This week they requested I make them mango panna cotta in bigger portions. Here is my version. This recipe is good for four. It was a family of three so I got to eat one for myself. Soak gelatine leaf in water. Once soft, squeeze excess water. Set aside. Heat the cream, milk and sugar in a saucepan over medium heat. When you notice bubbles form along the edges and when sugar has dissolved, remove from heat. Stir in gelatine until melted. Pour through a sieve. Add the mashed mangoes. Stir until combined. Divide diced mangoes between 3 glasses. Pour the mixture into each glass.. While chilling, make the glaze. Place the mixture in a saucepan. Add sugar. Heat the mixture until sugar dissolves. Stir in gelatine until melted. Pour through a sieve to get rid of lumps. When the panna cotta has set, pour the glaze over.